To fulfill its mission, the American Company of Irish Dance is working with creative directors Shane McAvinchey and Paula Goulding. 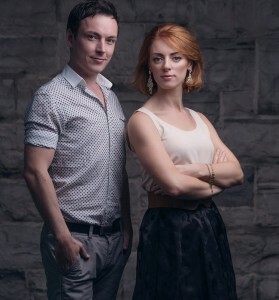 Shane and Paula come from the venerated, world-touring Riverdance production. As choreographers, Paula and Shane bring a unique vision to the realm of performance Irish dance and they communicate this vision through a refreshing and inspiring method of mentorship to the dancers that they train. Shane and Paula have collectively performed in 30 countries throughout the world and have performed to live audiences in excess of 8,000,000. They have also performed to TV audiences of millions. Paula Goulding spent 7 years touring the world with ‘Riverdance’ – starting out as a troupe member, then going on to become dance captain of the Broadway production as well as lead understudy. She traveled to such countries as the UK, Germany, France, Holland, Denmark, Italy, Australia, Mexico, Canada, Japan, China, the Far East and extensively throughout North America with an 18 month run on Broadway in New York City. Paula has also toured with the world renowned ‘Chieftans’ as their featured dancer and with ‘Ragús’ – the show as lead dancer and dance captain. In 2004, Paula co-produced, directed and choreographed ‘Dancing Thru The Ages’ – The Show. She has also choreographed for ‘Moving Hearts’ and recently for the ‘Irish Harp Orchestra’.She is the co-director / producer of new show Take The Floor which has had three successful summer tours in Ireland. Paula’s background in drama was showcased in Dion Boucioults ‘The Shaughraun’ in Ireland’s national Abbey theatre and also in London’s Westend in 2005 & 2006. Along with 7 other of the top leading dancers and choreographers in the country Paula showcased her skills on the RTE TV series Celebrity Jigs N’ Reels for 3 consecutive years. She has also worked as a dance coach on RTE’s TV Starsearch. Shane McAvinchey began dancing at the age of six and under the instruction of Anne Callanan he had much competitive success, most notably ranking 4th in the world. At the young age of 16 he started his professional dance career with ‘Riverdance’. During his years with the show he traveled across North & South America, Europe, Asia and Australia performing on stages and television stations across the globe. Since leaving Riverdance Shane has gone on to have principle roles in many productions such as ‘The High Kings’, ‘Dancing Thru the Ages’ and ‘Ragus’ and is the featured dancer with the ‘Niamh Ní Charra Band’. In 2009 he had the honor of the invitation to accompany Irish President Mary MacAleese on a state visit to Luxembourg where he performed for royalty and dignitaries representing Irish culture.